This morning my hen laid just a yolk in the nesting box. When I checked her she has something hanging from her vent. The hanging seems like a round ball with some layering around it. Is this the rest of the egg or is it something from inside her body? I don't think it's a prolapsed duct but maybe? I cleaned it and tried easing it out but it's attached to her vent in one spot. Should I cut it? Please help! Are you able to take and post a picture of it? 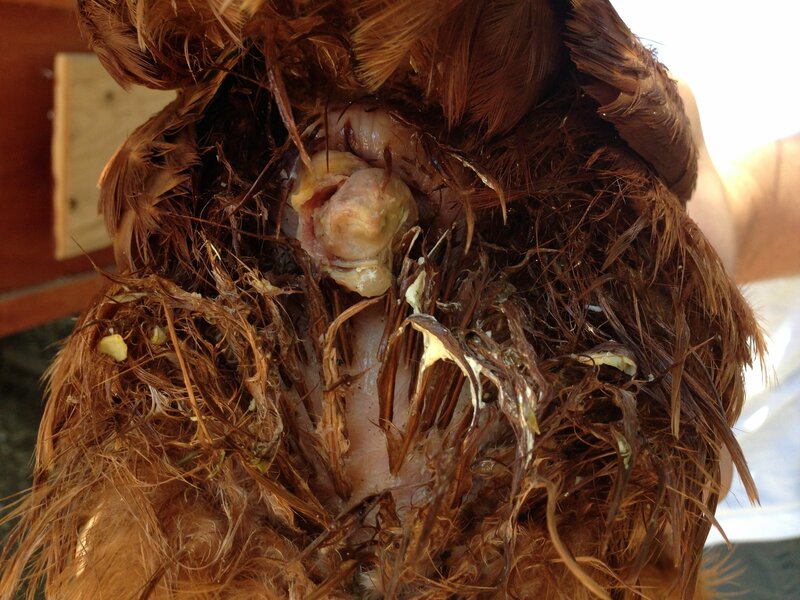 It most likely is just some egg material that mattered up in her feathers and got stuck but you want to make sure. If you can't take a picture, could you please describe it a little better for me? Is it pink and moist? Or is it hard and brown or white? Get back to me when you can hopefully I can help you further. Thank you for getting back to me. Here are two pictures, one from this morning and one I just took. The middle part is round and kind of hard, it looked similar to a cooked egg yolk. It was grayish this morning but now it has some blood. Around it are layers that look like egg white but also fleshy. I can't tell what it is. It doesn't seem to bug her when I touch it. I pulled on it gently and it is attached to her vent skin in one spot, and that did hurt her. Her vent looked fine this morning but now it looks a swollen from working to get it out all day. Also I've kept my other two chickens separate from her all day but now it's starting to get late and they want back in their run/coop. I'm afraid they will peck at it. Any advice on that? I'll post one from this morning and one more recent. I took a look at the photos -thank you for posting. That is a tough one!! It looks like mostly egg material but it is pretty well adhered to some prolapsed egg gland. The best think to do would be to have a veterinarian remove it because I have a feeling there is some nonviable tissue that should be excised. If you want to try yourself to removed it, take a very warm wet washcloth or paper towel and soak the egg looking stuff and very gently try to tease it away from the pink tissue. if you feel like you arent making any progress, try rubbing it with petroleum jelly to make the tissue part slippery and hopefully separate from the egg gunk. 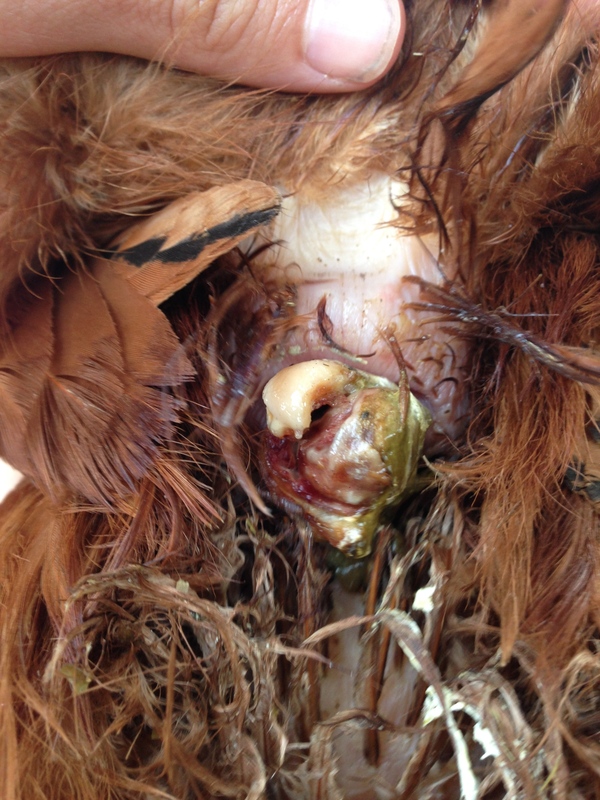 Once you're able to get the gunk removed, trim the feathers around her vent and smother it all around and a little on the inside with triple antibiotic ointment. You can give her 1/4 of a baby aspirin for pain if you'd like. Reapply the triple antibiotic 3-4 times a day for 3 days. She may reprolapse a little tissue that you can try to replace yourself but she may end up needing a purse string suture put in by a veterinarian to keep everything inside until she heals. If you decide to just try to have a vet do it tomorrow, rub Vaseline on it tonight to keep the tissue moist. I also think you should keep her away from the other girls if possible. It was a good call to separate her as they will peck at it if they discover it. Is she defeating ok? It looks like there is space enough to pass her droppings but you want to make sure. If she can't pass urates, we have a much more immediate problem. I hope that helps and keep me posted with what you decide to do! I can help you further if you need it. I'm just following up on our conversation about Ruby. How is everything going? My chicken died this morning. We are pretty heartbroken. After I talked with you she worked all that extra material out on her own and seemed to be doing much better, her vent looked normal, she was eating, drinking and acting like her normal self. But then this morning I found her dead in the coop. I'm not sure what happened and I feel pretty terrible about it. I did notice a small red clot or ball like thing right outside her vent when we took her body out but I didn't investigate too much because it was hard enough already. If you have any insight as to what you think might have happened, I'd appreciate it. Thank you for your help. If I made a mistake I'd like to know so I don't do it with my other girls. Her laying hadn't been the same for awhile, maybe since we changed to a more "natural" organic feed. Not sure if that made a difference?